Dude, can I crash on your Athena Sofa? Normally, when you spend the night sleeping on your friend’s couch, you’re usually in for a second-rate experience. I mean, the best you can hope for is that it folds out into a bed. In the case of the Athena sofa, I could easily make it into an office. I mean, it has an LCD in each armrest that are integrated by a multimedia PC. I see that one of them has a keyboard, but if they were touchscreens, then I’d have a fun time running all my operations with Windows 7. 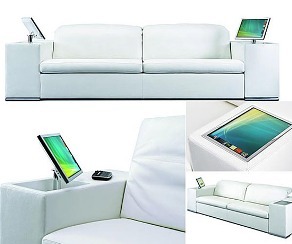 The Athena sofa also comes with an iPhone and iPod dock, and a set of hidden speakers that include an 8-inch subwoofer. Like I said before, I could easily live here. I would imagine that after a few days, I would de-evolve into a giant single-cell organism and be the first actual couch potato. Of course, there is a price to pay for such comfort. In this case, the price is about $15,436. I’m assuming that is the price without the moving cost. Coolest Gadget of the month. Though the price is not too cool. It would be great if you could just purchase the sofa and retro fit your own gear. Fantastic idea!